Actor Matt Damon says there was a certain giddiness while making action-adventure fantasy "The Great Wall". "Being on set, there was a certain giddiness, we felt as we were doing something that had never been done before. It is hard to do that in a medium that has been around for 100 years. There has never been a collaboration at this scale and the crew represented that," Damon said in a statement to IANS. The 2016 action-adventure fantasy was co-produced by Chinese and American companies. 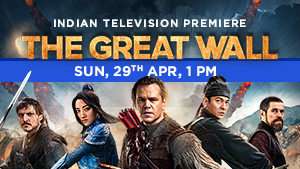 The film will have its Indian television premiere on April 29 on Sony PIX. On the film, Damon said: "You had half Chinese crew and rest of them had a mix of Americans, South Africans, Europeans, Australians and people from New Zealand. We really were this international group. "We had a hundred translators running around the set trying to make sure everybody could understand each other. Then at the same time all of the cast and crew had made a lot of movies all over the world so we had that common language among us. It was just really fun to be on set as the scale of the production is beyond imagination. It felt like a beautiful cultural collaboration that everyone was getting together and sharing an art form that we love so much."